We just released a sample chapter of the Debian Administrator’s Handbook. It covers the APT family of tools: apt-get, aptitude, synaptic, update-manager, etc. If you liked this chapter, click here to contribute a few euros towards the liberation of the whole book. That way you’ll get a copy of the ebook as soon as it’s available. Thank you! I also invite you to share this sample chapter as widely as possible. We’re only at 40% of the liberation fund and there’s less than 2 weeks left. I hope this book extract will convince enough people that the book is going to be great, and that it really deserves to be liberated and bundled with Debian! Raphael, the sample chapter looks great. As promised, I made a contribution to the liberation effort. I am definitely interested in buying a print copy of the book when it becomes available. We need all the Debian books we can get. 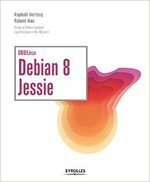 Thank you again for all you do for Debian as a developer and as such a great supporter of the users of the distribution. We really need this book (and I hope you do an Ubuntu version as well). I.e. it died with a “dpkg: unknown option –forceconfold” error when the forceconfold option was kept on the command line. Presuming this is due to doing an upgrade rather than dist-upgrade? Running squeeze 6.0.3. Hi Raphaël, Doh! Thank you! And good catch! I was copying/pasting using acrobat reader, and it dropped the dash (have just retested it, it’s reproducible). Evince keeps the dash. But “pdftotext” drops the dash too. So it’s possible that there could be something odd about the dash or formating on that line that confuses some but not all PDF viewers. If only I could afford you, I’d hire you to fork GNOME2.